Naming things is very difficult. Okay. Naming things is easy. But naming things well is tricky as hell. And it turns out that the problem is the opposite of what you'd expect. Coming up with names, totally trivial. Coming up with names that sound related is also quite easy. But in reality, named places often don't sound related. Popping open a map near my house results in names as diverse as "Half Moon Bay", "Redwood City", "Hayward", "Cupertino", and, of course, "San Francisco". What do those have in common? In fiction, naming is important. Naming is what gives us a first impression: of a place, of a concept, or of a character. If you're making something set in the present day, or in some real-world historical setting, you can tap into a lot of assumptions we make about locations. Knowing that a character is from Chicago instantly gives us a mental image that an origin from Paris would not have. But when we're dealing with the future, or with fantasy worlds, or universes completely disjointed from our own, we can't use those techniques. We have to tap into what the location names say on their own instead of our associations with the locations themselves. These same techniques can be used for things that aren't locations as well, but it's time for me to stop talking in hypotheticals and start talking about concrete examples. 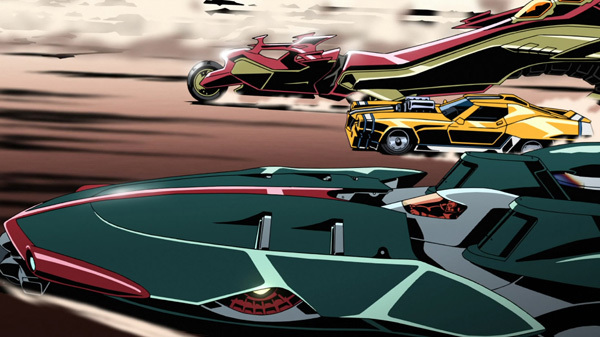 Redline is a movie about totally badass racers. I'm not going to talk about the movie itself very much (you should see it, by the way – see it in blu-ray if you possibly can, it's worth the pixels). But what I've found fascinating about Redline is its unexpected depth. The plot of the movie itself is very superficial, and yet there's surprising complexity buried underneath the surface. It feels like the universe was fleshed out far more than you'd really expect from what is basically a silly anime movie about racing. Now, while it turns out there really is a lot of backstory, posted in snippets on websites and in interviews, I don't know if there's really enough to justify the feelings I get from it. Those feelings are sparked entirely by the truly wonderful names. 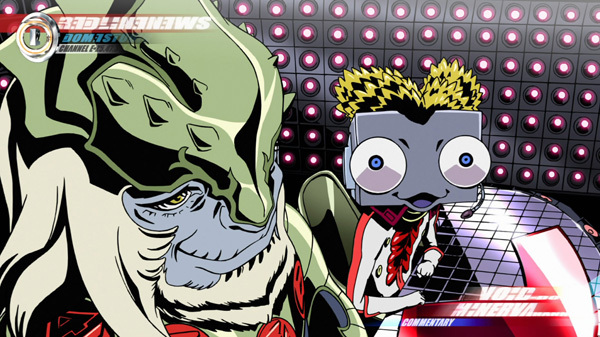 Let's start with something easy: The planets that Redline takes place on. Inarod. Shyen. Orloris. Oldnn. Elmnshy. The problem with these names is that they don't say anything. Besides the accidental English words embedded, like "shy" and "old", they have nearly identical sounds. Imagine eighty names of this form and you'll quickly find it hard to distinguish between them. Meanwhile, Redline's planet names run from the blatantly descriptive "Roboworld" to the evocative "Supergrass" to the oddly human "Dorothy". Who names a planet "Dorothy"? There's a story there. A story we haven't been told, but a story nonetheless. It may not even be a story that the scriptwriter knows, but it's a hook that the scriptwriter could, at some future point, use to write a story. Rattle-king Void Do. Mr Minerva Hanness. Kurukuru=Daza. Shoto=O-Jin. Old Man Mole. Funky Boy. Colonel Volton. Secretary Titan. Dr Sabose. Already you can probably see a few themes. Unsurprisingly, Colonel Volton, Secretary Titan, and Dr Sabose are all part of the same organization. But there's also a bunch of plot hooks. What's a "rattle-king"? It's never explained, that's just how Void Do introduces himself. Rattle-king Void Do spends a chunk of the plot commentating side-by-side with Mr Minerva Hanness, and we've already got interesting conflict here – the names alone tell you that these are two different personalities, not Generic Elf Name #1 and Generic Elf Name #2. And these names also sound fundamentally alien. How do you pronounce an equal sign? Why does "Mr. Minerva Hanness" have an honorific *and* two names? This is not a movie where people refer to people as "Mr.", so already the tall quiet "Mr. Minerva Hanness" stands out, especially next to the knee-height box-headed chattering Void Do. But the focus of Redline is racing, and I haven't touched on the racers. The racers are extra-interesting because many racers race in pairs, each one is associated with a racecar, and the cars are given names as well. This means we have trios of associated names instead of single names, and that gives us opportunity to look for themes. There's a few patterns you can find in here simply by glancing at it. 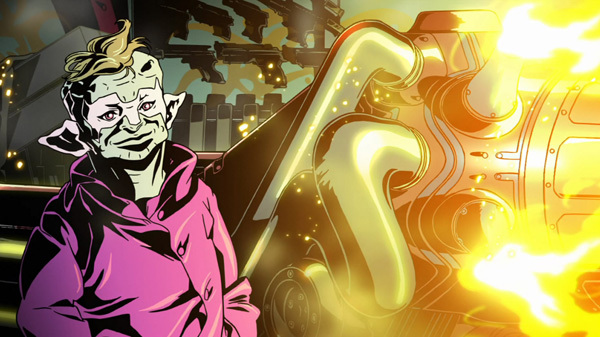 A lot of the racers, such as Captain-2-Block's Captain the Classic and Sonoshee McLaren's Crab Sonoshee, have cars that are named after themselves. Some of them have cars that are race-themed, like Trava and Shinkai's Speedmaster and JP's Transam 20000. 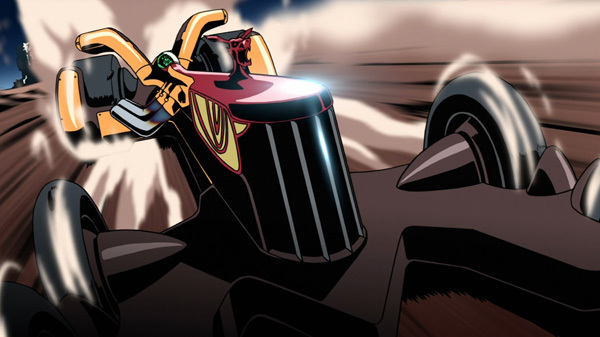 Finally, Machine Head Tetsujin has gone with the egotistical approach – seriously, who names their car "Godwing"? Each of these character/car combinations gives you a little mental picture of the character. Bons likes weaponry and serial numbers – one wouldn't be surprised if his last car was "Bons Missile-EP3". Gori-Rider is a militaristic gorilla. Little Deyzuna may have a big brother, or his size may be an important part of the character. Count Markdie could be royalty of some kind. Trava and Shinkai really love racing. Are these aspects important to the plot? Nope! Not at all. I'm making all of that up, it never factors in whatsoever. But they all contribute to give the universe an underlying foundation of implied backstory, and a foundation that goes to quite a lot of effort to avoid being thematically monochromatic. Frequently, creators spend all their effort on the concrete things – on the surface of the art, on what the viewer is intended to see and experience. While I think it's questionable how much effort should be spent on the backstory, it doesn't take too much work to imply the existence of a complex and deep foundation. It's unclear whether Redline has extensive backstory or whether Redline just fakes it quite well. The key behind faking backstory is variety and thematic hooks. Every civilization has a multitude of legends, every universe has a multitude of cultures. If your names all sound like they come from a single culture, split them up. Look at what you've done, look at the patterns in your names, intentionally avoid those patterns in the future, and make sure you've left plenty of opportunity for spinning off future stories. Even if you never take those opportunities, your world will be better for it.